What are treatments for warts and skin tags? Warts can be seborrhoeic warts (benign skin growths due to genetics and aging), or viral warts (caused by virus). If it is a viral wart, it can be infectious due to the Human Papillomavirus (HPV). In this case, a person may get infected by the virus through touching, including skin to skin contact or by simply touching an object that has been previously touched by someone who has HPV. So how can we treat warts and skin tags? A laser treatment will be able to target the treatment area accurately. The most common laser used to treat viral warts is Carbon Dioxide (Co2) Laser. Co2 laser emits a beam of laser light. This light is absorbed into our skin, and the heat damage from the laser destroys the skin cells causing the warts. This is a very quick and effective way to remove warts. An electrocautery is the process where current is passed through to generate heat and treat the warts on our skin. This heat is passed through to a needle which is put to the wart. Electrocautery is one of the treatments where the warts are less likely to reappear after the treatment. It is a common treatment used for genital warts especially. Lastly, Cryotherapy is the treatment to remove warts through freezing them off using liquid nitrogen. Using a cryotherapy gun, the frozen warts will form blisters and eventually fall off. Cryotherapy is a recommended treatment choice for plantar warts on the feet, as it can penetrate deep into the skin without causing any scarring at the sole of our feet because the skin there is very thick. However, when treating warts on the face, it can be difficult to estimate the depths of the treatment, and sometimes it may cause scarring and post-inflammatory hypopigmentation. So cryotherapy may not be your best choice for treating the warts on your face. Removing warts on your own without any medical treatments is also commonly spoken about, but definitely not encouraged. If you dot acid on a cancerous cell (which is a possibility for warts), the cells will indeed disappear, but they will come back with a vengeance, and possibly spread to other parts of our skin. Using acid, we cannot control how much or how accurate we are when treating these warts. If we use a strong acid, the damage on our skin will be much deeper and wider than the actual wart itself. And when we press hard to let the acid penetrate the wart, the acid will go deeper and wider into our skin. 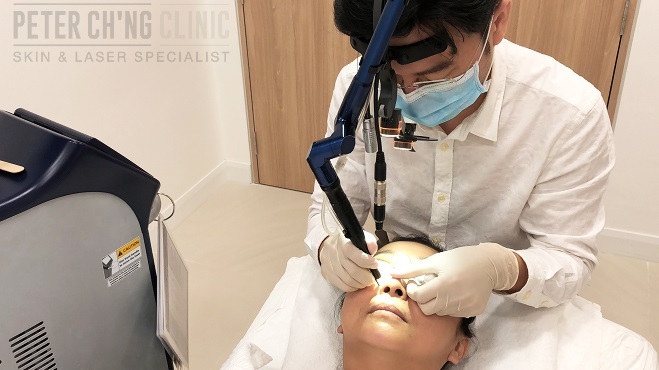 No matter how we do it, it will never be as fine a treatment as when using a laser beam. If we use a laser treatment, we can be very precise and accurate. No matter how small the lesion on the skin is, we can target the specific wart, and can also determine the depths of which the laser should focus on. This produces a quick, effective, and safe treatment for warts. Sometimes warts can be mistaken for skin cancer as well, but most of the time we can differentiate them clinically. Through an examination using a dermatoscope to examine the lesion, any skin warts that are being suspected for skin cancer should be followed with an immediate skin biopsy to check and act on any potential risk. At Peter Ch’ng Clinic, we always put your safety and wellbeing as our top priority. We take all the necessary measures and steps to make the most accurate examination and diagnosis of your skin condition, and plan the best treatment for your condition. To enquire more about Treatment for Warts & Skin Tags, contact us or book an appointment here! Warts and skin tags are growths on our skin that can be either caused by virus or seborrhoeic (benign skin growths due to genetics and aging). You shouldn't try to remove warts and skin tags on your own as this may cause injuries or infections. There are proper dermalogical solutions for these conditions.